Hindus believe in one Supreme Being who is infinite, all-pervading and eternal and the source of all creation. God is in everything that exists, and is at the same time beyond the manifest universe. The various functions and aspects of the Supreme Being are given different names. For instance, the Trinity of Hinduism consists of Brahma - the Creator, Vishnu - the sustainer, and Shiva - the Destroyer. The incarnations of the Trinity are worshipped in various forms. The temples usually have some incarnations of the Trinity as idols for devotion and worship. Wellcome to Sarvajana Mandir - A Hindu Temple in Huntsville. Our temple - Sarvajana Mandir - is authentic and built according to traditional Hindu architectural design. 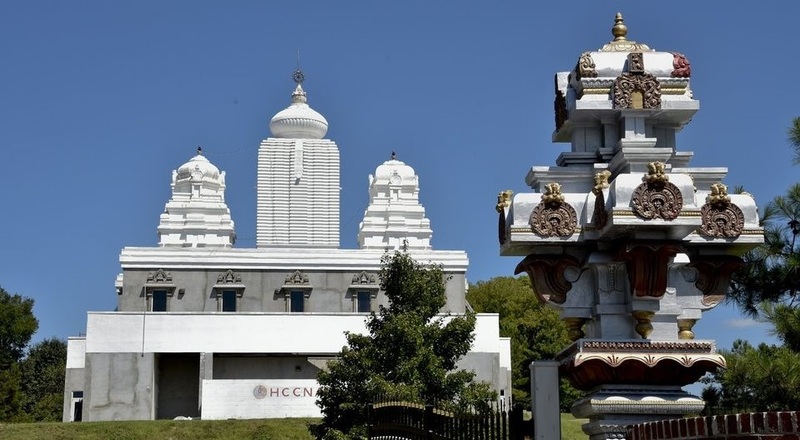 It is a majestic, elegant temple, and truely an asset to the Hindu community in Huntsville. The temple has two "praharam" (encircling corridors) and enshrines deities from every corner of India. The temple is located in Harvest - a northwest suburb of Huntsville and only thirty minutes away from downtown Huntsville. It is the only temple in the Huntsville metropolitan area that provides a full range of religious and cultural services. Volunteers run the temple through various committees and devotees are encouraged to get involved and share their talents and time. It encourages family and community participation from the Huntsville metropolitan area and vicinity through various religious, cultural, and educational activities. The mission of the temple is to provide a place of worship for the followers of Hinduism in the Huntsville area, to provide a forum for scholarly discussions of the Hindu philosophy and to facilitate Hindu worship in various forms such as Poojas, Bhajans, Prayers, Satsung and related religious activities for all Hindu denominations. Please navigate through menu to know the detail of services and directions. The following are the list of planned events in the next 30 days in addition to the regular weekly, monthly and yearly events. Please visit full event listing for all events. May 12 - Sunday Mother's day will be celebrated. Program details will be sent later. 12.45 P.M - 1.00 P.M. - Parikrama of Lord Madan Mohan (Krishna) around the Temple inside. Temple is looking for sponsors for Sankathara Chaturthi. Sponsorship is $101.00. Please call the Temple 256-771-7730. We are very pleased to invite you to attend a nine day Shiva Purana Katha by Pt. Jayesh Vyas in the temple from February 15 to 23, 2019.